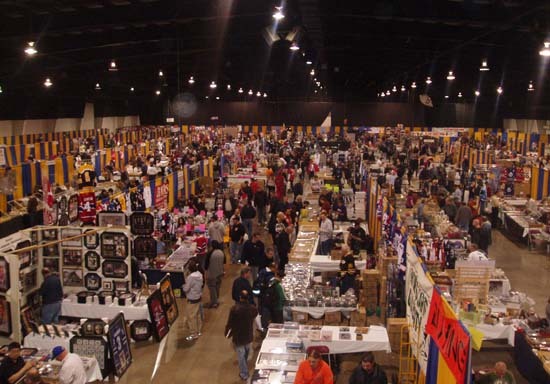 COMC is heading to some Card Shows this weekend! Hello COMC Nation! We just wanted to let you know that COMC representatives will be attending card shows this weekend! Those of you in Northern California can drop by and talk to the head of our Shipping team, Geoff Holland, at the show in the Serramonte Center in Daly City, CA. Geoff says you can give him a call on Saturday, if you’re having trouble tracking him down – his number is 1-425-260-8025. Folks in the Portland area can drop by and say “Hi!” to the head of our Processing team, Jim Osborn, at the COMC table at the show in Mall 205. Jim will be there on Saturday only, but he didn’t give us his phone number – but, he’s tall and it’s easy to find him in a crowd! Geoff and Jim will be accepting submissions for COMC, so you can drop your cards off and save a little bit on those shipping charges. This entry was posted in card shows, news. Bookmark the permalink. What is the process of dropping items off with Geoff? The usual shipping and packing but no cost to drop off?